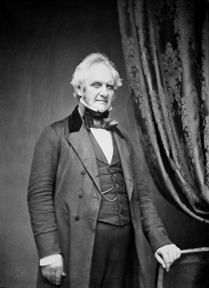 George Peabody. Licensed under Public Domain via Wikimedia Commons. Peabody Buildings, housing blocks for ‘the artisan and labouring poor of London’, were built from the trust funds set up by the philanthropist, George Peabody. Peabody was born in Massachusetts in 1795 but spent most of his life in London. In March 1862 he donated £150,000 to endow a fund ‘to ameliorate the condition of the poor and needy of this great metropolis and to promote their comfort and happiness.’ Today the Peabody Trust currently owns and manages approximately 19,000 homes of which 960 are in Lambeth.